Description: A stunning work of scholarship, the Norton Critical Edition of The English Bible, King James Version, is the most accessible edition available. In celebration of the 400th anniversary of the King James Bible, these long-awaited volumes bring together succinct introductions to each biblical book, detailed explanatory annotations, and a wealth of contextual and critical materials. Archaic words are explained, textual problems are lucidly discussed, and stylistic features of the original texts are highlighted. For the New Testament and the Apocrypha, the introductions and annotations by Austin Busch and Gerald Hammond provide necessary historical and cultural background, while illuminating the complexity of the original texts. Supporting materials are divided into five sections. �Historical Contexts� excerpts Greek, Roman, and Jewish sources, such as Josephus, Philo, Tacitus, Pliny, and the Dead Sea Scrolls. Selections from Papias, Marcion, and Valentinus, among others, provide insight into the diversity of early Christianity. �Exegesis� explores classic New Testament commentary from Origen and Augustine to Strauss, Nietzsche, Wrede, and Schweitzer, who focus on the Gospels� vexing relationship to history. Essays by contemporary scholars and critics complete the section by exemplifying a range of interdisciplinary approaches to New Testament literature. The New Testament�s powerful language and images have inspired some of the finest poems in the English language. This volume collects a wide selection of lyric poems, hymns and spirituals, and epics, from the Dream of the Rood to works by Countee Cullen, Elizabeth Bishop, and Anthony Hecht. Case studies designed to stimulate classroom discussion trace the development of Pontius Pilate as a character in post-biblical literature, follow the centuries-long exegetical debate about Romans 7, and survey competing hermeneutical approaches to Revelation. A final section samples fifteen translations of 1 Corinthians 13, from Wycliffe to contemporary versions. 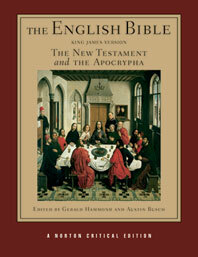 Citation: Stephen Pattemore, review of Gerald Hammond and Austin Busch, eds., The English Bible, King James Version: The New Testament and the Apocrypha, Review of Biblical Literature [http://www.bookreviews.org] (2014).